There are many different sized tablets to be found on the market and now there is finally ONE Mount that is adjustable to fit all of them…. 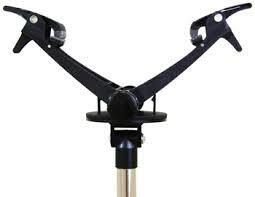 We like the Universal Mic Stand Mount because of its versatility, its adaptability and its quality build. The Universal Mic Stand Mount has two arms that can be adjusted to hold anything from a smartphone to a 13 inch diagonal screen tablet. The Universal Mic Stand Mount, available from TheGigEasy, holds a tablet in similar fashion as would a human hand. Technically, the Universal Mic Stand Mount is designed to mimic a pair of human hands gripping the tablet between the thumb and fingers alike. This approach would be considered the natural way to design the perfect mount. Is the Universal Mic Stand Mount perfect? The Universal Mic Stand Mount is a significant improvement to previous tablet mount designs, if only because the mount can hold a tablet while the tablet is still in its protective case. YES, finally there is a mount that will hold s tablet, without the need to remove the tablet each time, from its casing. The Universal Mic Stand Mount will also Rotate 90 degrees in either direction, to support landscape or portrait viewing. Of course, the Universal Mic Stand Mount is intended to be mounted on a microphone stand by way of its built-in standard, female mounting bracket. The Universal Mic Stand Mount is made of high grade black coloured plastic, strong metal springs and edge clamps with rubber feet that provide a sure grip to hold any valuable tablet device in place with confidence. I would like to see ‘thumb screws’ on the back instead of ‘X’ screws in order to allow easier angle adjustment and tightening when required – but nobody asked me. I would like to see the metal, silver coloured springs on the clips, which are quite visible, painted black, in order to be less of a visual distraction. But these are relatively minor issues when you think of the fact that the adjustability of the Universal Mic Stand Mount will prevent the device from suffering the premature obsolescence of EVERY previous tablet mount design to date. The Universal Mic Stand Mount folds down to a compact size for easy transport and offers compatibility with so many different tablets that it is really something to admire and of course, to own. Vocalists, using a Page Turning device with a Universal Mic Stand Mount for lyric reference, can focus on the performance and finally be freed of the burden of having to appear soldered at the eyeballs, to their music or lyrics. The Universal Mic Stand Mount really is, a handy, well designed tool, that will be welcomed by tablet owners around the globe, no longer required to remove their tablet from its protective case each time it needs to be mounted at a gig for use. 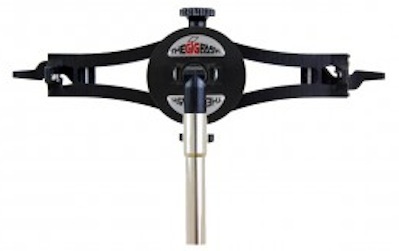 Check out the Universal Mic Stand Mount, as well as the many other very useful Tablet related items available from TheGigEasy on-line store. January 16, 2014 in Music production.